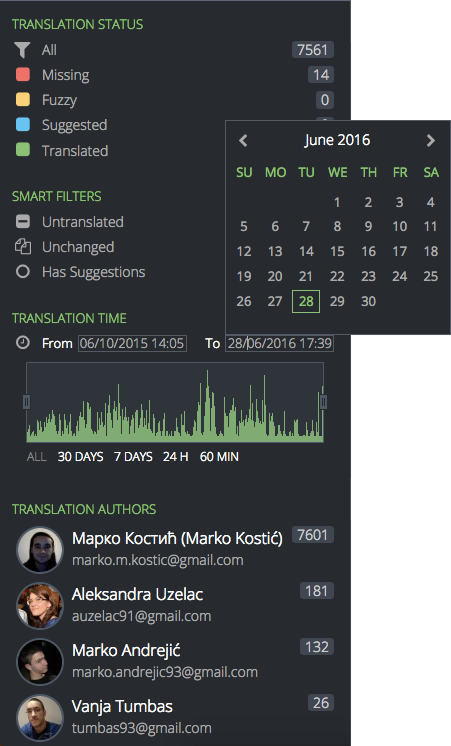 A new filter is available in Pontoon that allows you to search for translations submitted within a specified time range. Do you want to review all changes since the last merge day or check out work from the last week? It’s now easier than ever. Time range can be selected using the manual input, calendar widget and a few predefined shortcuts. Or perhaps more conveniently using the chart that displays translation submissions over time, so you don’t shoot in the dark while defining range. With recent additions to strings filters, we’ve also slightly redesigned the filter panel to make it more structured. Also available are translation counts, so you don’t need to apply the filter only to learn there are no matches. We have more plans for improving filters in the future, most notably with the ability to combine multiple filters, so that you could e.g. display all suggestions submitted yesterday by Joe. Our current focus is dashboard redesign, which will add some features currently only available on external dashboards. For more details on what’s currently in the oven, check out our roadmap. If you’d like to see a specific feature come to life early, get involved!